We haven't had internet access for several days, but everything is going well. We are in Kota now, the Emmanuel/Hopegivers headquarters in India. 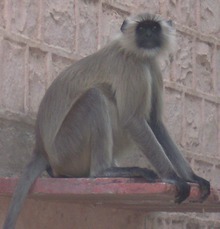 Kota is about 8 hours south of Delhi, still in the northwestern part of the country somewhat near Pakistan. Kota is more hot and dry than Delhi, with afternoons feeling at least 80 degrees. It is AMAZING and wonderful to be here, but also very sad to see what havoc the persecution has wreaked on their schools, orphanages, and even buildings.The schools and orphanages here in Kota have lost literally thousands of kids during the persecution, but I am prayerful that God will rebuild them. It appears like God is using this persecution to establish and even strengthen the future of Emmanuel ministry here in India, just like God reminds us in His word that "what man meant for evil, God will use for good" (Gen. 50:20). I really love Kota. After Delhi and Jaipur, it has a "small town" feel (I think there are only 1.5 million here). 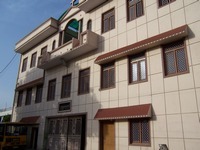 While here in Kota, we'll be staying at the Bishop House, which is a large building that houses Sam, M.A., the church, the Bible College, the house workers, as well as many dorm-type rooms for visitors. It is three stories and is really pretty with an outdoor courtyard in the middle. My task here is to work at the business office during the days with some of the staff, and Maria will be visiting schools and orphanages. She will also be doing some teaching and also working with teachers to share her latest updates in identifying learning disabilities in students. I will be talking to the field workers about getting updates from orphanages for the web site and spending time with Rebecca (an executive assistant in the main office) and also with M.A. Thomas. I'll also be working on getting ideas and stories for a book that I am hopefully going to be writing for the ministry. One thing that I absolutely love is that Emmanuel Ministries is not just feeding orphans as some of the other humanitarian ministries in operation, but raising them up to carry the gospel into the world. And amazingly, 80-90% of the orphans who grow up in Emmanuel orphanages go on to full-time Christian ministry! Isn't that amazing? In fact, their desire is to carry the "Good News" into the 450,000 (out of about 700,000 total) villages that have never heard about Jesus. And they are definitely gaining ground! We are meeting the most wonderful people here in Kota! There are many of the Bible College students who do various jobs around the Bishops House, but Maria and I have especially taken to the four girls who are doing the cooking, cleaning, and overseeing the day-to-day operations. They are such hard workers and yet so full of joy! They buzz around the house, singing, laughing, and doing their work with happy attitudes. They also get along amazingly well. Even late at night sometimes they are sill cleaning up dishes or whatever, dog tired, and yet they are being very sweet to each other. I absolutely LOVE Emmanuel orphans—they are a gentle, serving, and outstanding kids! Today it was so cool (not the temperature). As I was walking along from the Bishop House to the business office (about 5 blocks), I saw the cutest monkeys swinging in trees and hanging out on buildings and such. Walking down the street is almost like being in a National Geographic! Everyone is very friendly and we are having a super time. We've gotten to visit the main school, orphanage, hospital, and some other nearby orphanages too. Everywhere we go I am so impressed with how mature and wonderful the kids are. Thanks for the information. I’ll be a little bit more educated now :). Keep posting, pretty please. Gosh I’m goind back to my job, the boss is approaching :). Best wishes! This is site that I’ve ever gone on. I am glad such free information is available on the internet. This would not be found with only traditional media. We stumbled over here by a different page and thought I might check things out. I like what I see so i am just following you. Look forward to looking at your web page repeatedly. Thank you for your detail. Diahoerea is a heredatory ilness, it runs in the family.